The journey will take you on long roads surrounded by a rich spectrum of greenery and overarched by wild blue skies. 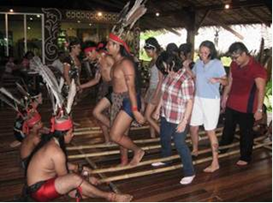 In the village, behold the cultural diversity that is our pride, where you can savor the soul of Sabah. Each home in the village was built by descendants of the tribes they represent and offer you a truly genuine experience. Seeing everything in and around the village lends to its magical prowess of taking you back in time. Not only does this village portray these tribes through the architectural genius of their traditional houses, but also through a range of simulated lives of the old epoch by the residents of the village. Acquaint yourself with each tribe as they invite you into their house and experience their simple yet intricate lives. As you traverse through the village, you will find demonstration huts along the main houses in which daily activities of old times come to life. For example, the making of a blowpipe, starting a fire (from bamboo tree - you will learn the steps of making fire without the help of a lighter), tattoo-making (and its symbolisms) and more. This tour brings you across the mountainous Crocker Range with a panoramic view of the countryside and soaring hills. Whilst en route to Kinabalu Park, you can catch the magnificent sight of Mount Kinabalu, South East Asia’s highest peak. The Park is a World Heritage Site with incredible bio-diversity, a haven for nature enthusiasts. On arrival, enjoy a guided nature trek along one of the many trails in the park before proceeding to Poring Hot Springs which offers visitors the opportunity for an invigorating dip into its hot sulphur springs. 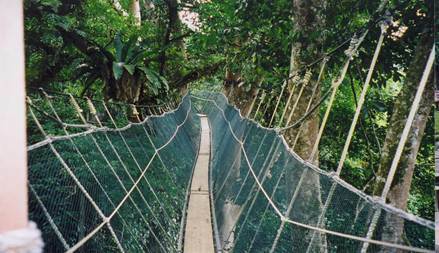 For a bird’s eye view, take the 41m high canopy walk which offers a spectacular view of the Borneo Rainforest. Take a trip to not one, but two islands. After doing the zipline in Sapi Island, you will be taken to Manukan Island for lunch. You can also enjoy some of the water sports available at the island for rent or go snorkeling. The “Coral Flyer” is Sabah’s newest tourist attraction. It is the World’s Longest Island to island Zipline and has just opened in Tungku Abdul Rahman Marine Park. It stretches for 250 metres across the channel that divides the Gaya and Sapi Islands. There are two lines allowing riders to go down in pairs and reaches speeds of up to 60km/hour. The adventure starts at Gaya Island and takes you to the ending point on Sapi Island. 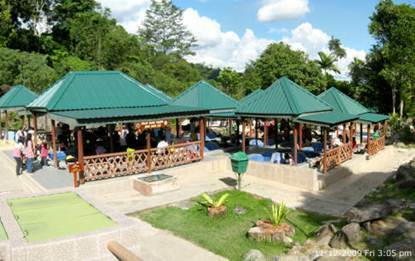 Travel north of Kota Kinabalu to Kiulu River, past quaint villages, scenic countryside and the rural town of Tamparuli. Start with light refreshment followed by a short briefing conducted on the Kiulu river bank preceding your adventure. With headwaters from Mt. 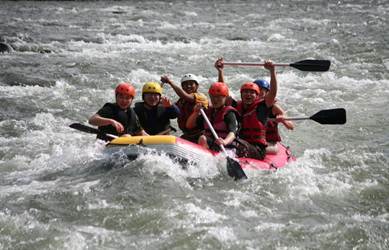 Kinabalu, the river is perfect for newcomers to the sport. 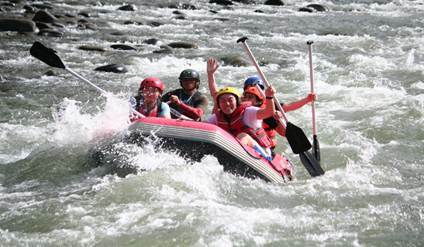 Deep pools punctuate the river rapids, giving you ample opportunities to indulge in body rafting or swimming. The experience takes just 1 to 1 ½ hours, depending on the river stage. If the thrill-seeker in you wants more, this package is for you. Following rafting of the Kiulu River, a BBQ lunch is provided. After lunch, proceed with the next adventure that is Ultimate Zipline. 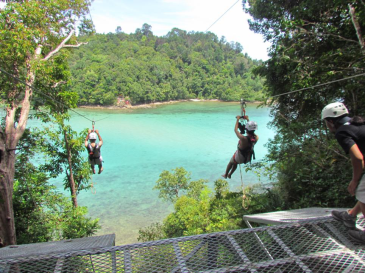 Whizz across the Kiulu River and back again on Borneo’s longest zipline! With views of Mount Kinabalu and only 45 minutes from Kota Kinabalu city centre, our jungle and river side adventure centre in the Kiulu Valley is the perfect place to zip, climb and abseil! 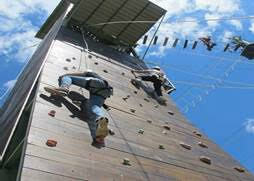 Scale the tower walls to a height of 10 meters on the climbing wall. With a variety of routes, there’s a challenge to suit all ages and abilities. Our instructors are on hand to teach you the basic principles of climbing to get you started. 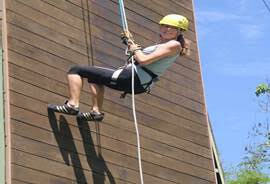 Dangle off the side of our activity tower as you abseil down from 18 metres. Take in the jungle and river side views on the way down. The crew will teach you the skills you need to descend the tower.